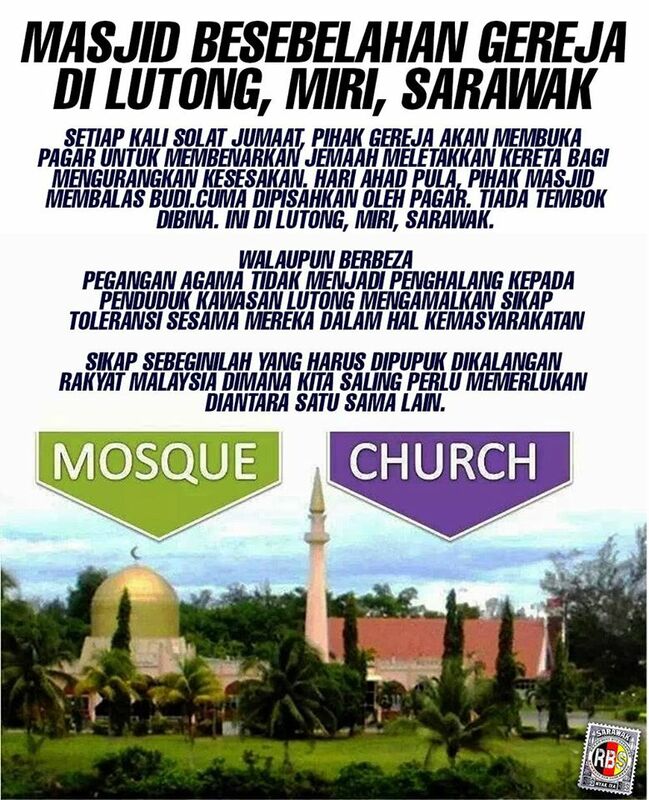 Masjid sebelah Gereja di Lutong, Miri, Sarawak – Setiap kali solat jumaat,pihak gereja akan membuka pagar untuk membenarkan jemaah meletakkan kereta bagi mengurangkan kesesakan. Hari ahad pula, pihak masjid membalas budi.Cuma dipisahkan oleh pagar. Tiada tembok dibina. Ini di Lutong, Miri, Sarawak. Walaupun berbeza pegangan agama tidak menjadi penghalang kepada penduduk kawasan Lutong mengamalkan sikap toleransi sesama mereka dalam hal kemasyarakatan. Incessant attacks have been launched against DAP Chong over the past few days eversince his call for the adoption of the 10 Point Policy Reform to the Chief Minister. DAP is seen trying to capitalise and claiming credit for all the State’s good work and also trying to discredit the Chief Minister who have managed to turn many doubters to his side. There is an air of uncertainty on DAP’s side as it tries to recover losts ground and trying to tarnish the good work of the Chief Minister. DAP feels that with CM Adenan they are losing the INVINCIBILITY where the Pakatan coalition wrestled 16 out of 71 seats in the State Assembly in 2011. The next state elections will be due in 2 years time and Pakatan have started to unleash their fury towards the State leader and checking him on all angles. The Pakatan coalition feels threatened for once and CM Adenan might just be DECEPTIVE enough to wallop them at their weakest point. Moreover,the infighting in DAP has not be suppressed with the removal of former ADUN Voon and sacked YB Fong. 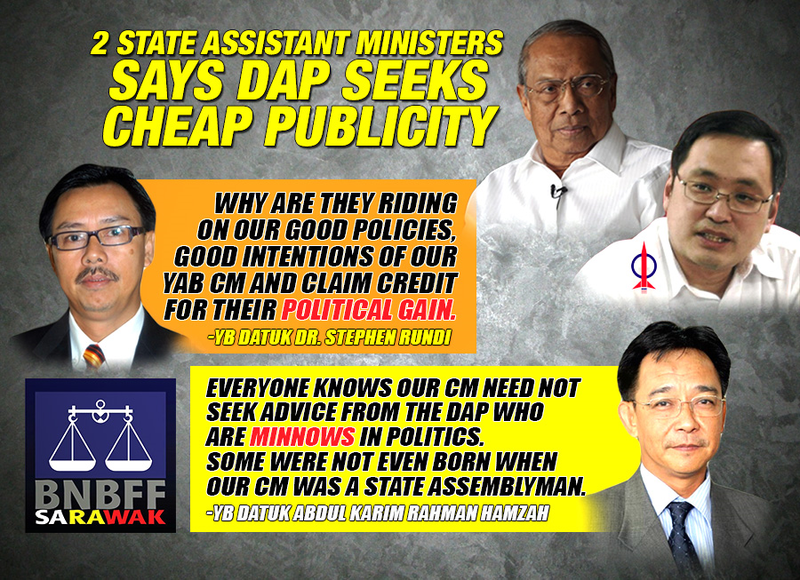 Professionals are having second thoughts about DAP and Chong is seen to be building a family legacy. The last notable professional to join DAP was MP Julian Tan and the professional chain have now stopped says an insider. DAP are finding ways to make itself still relevant with the people and they are seen to be capitalising on the CM noble intentions by riding on his feel good factor. Will DAP be able to maintain their grip on their seats in PRN11? This call by the the top leaders in the BN Coalition is indeed timely. It was getting a bit out of hand and all hell would have broke loose if it was not CONTAINED. Good Move for the SOLIDARITY FOR THE BN FAMILY AS A WHOLE. PRS President James Masing reiterated the call and he is abiding with the gag-order . 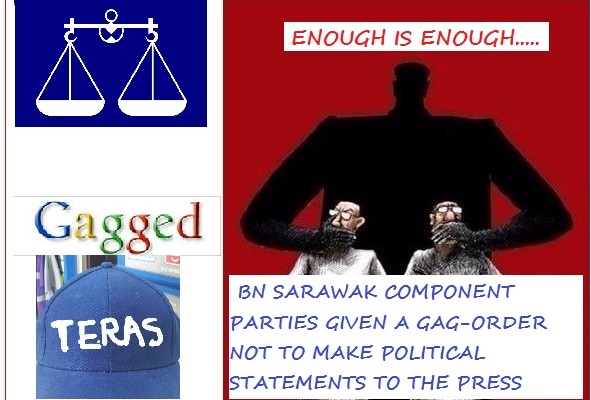 KUCHING: Parti Rakyat Sarawak (PRS) president James Masing has confirmed that Barisan Nasional parties in Sarawak have been issued with a gag order against making political statements in the media. “We have been told not to make political statements in the press and I must abide by the rules of the game,” he said while declining to reveal the discussions during his party’s supreme council meeting last night. Masing could not reveal who issued the gag order and how long it would last. “Because of that (gag order), whatever political matters discussed among party leaders would be confined to the four walls,” he said. However, Masing confirmed that the supreme council did discuss political matters “but it’s not for public consumption”. Apparently, the supreme council discussed a July 2 meeting he had with Prime Minister Najib Tun Razak. “I went to see him (Najib) to discuss political issues but what we discussed is not for public consumption,” he said. He said that his meetings with Najib and Adenan were fruitful. PRS insiders have speculated that Masing did not go to see Najib and Adenan of his own accord, but may have been summoned following the war of words among the BN partners on various issues. It is believed that the recent “merger of minds” accord among PRS, SPDP (Sarawak Progressive Democratic Party) and SUPP (Sarawak United People’s Party) on seat allocation and against Teras entering the BN was also discussed. It’s not known whether Najib and Adenan held similar meetings with SPDP and SUPP leaders or with Teras. This article appeared in local daily and this blogsite also carries the full text. We extract the article from the blog. KUCHING: PBB Supreme Council member Datuk Abdul Karim Rahman Hamzah is surprised that PRS, SUPP and SPDP are jittery over state seats at this point in time. With the state election still far off, he was baffled that the three BN component parties had continuously made a ruckus through the press to express their dissatisfaction. “Why are they (PRS, SPDP and SUPP) all jittery about seats at this moment of time. 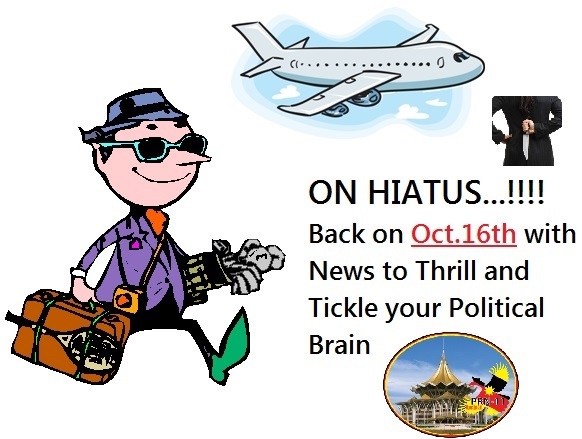 The state election is still very far away and the State Legislative Assembly (DUN) is not even dissolved yet. “Why the furore about seats at this time and why was PBB not invited or being approached even if it’s to discuss (about) seats?” he argued. 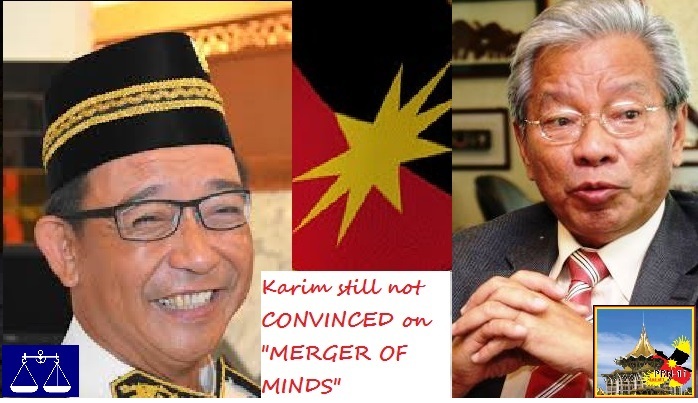 He was responding to a statement by PRS president Tan Sri Datuk Amar Dr James Masing that the ‘merger of minds’ among SUPP, SPDP and PRS was still relevant even though Pelagus assemblyman George Lagong had been offloaded from the Teras bandwagon. The Assistant Minister of Youth Development and Asajaya assemblyman remained unconvinced even though SPDP and PRS youth wings had explained that the reason why PBB was not invited was because the party was not affected in terms of seat allocations. He even said considering that PBB is the backbone party of the state BN, it would definitely be courteous of the three component parties to discuss with PBB matters affecting the state BN or any unhappiness among the component parties. Abdul Karim said PRS’ main reason for being in the ‘merger of minds’ pact seemed to be because of the presence of Lagong during the announcement of the formation of Teras. Masing, who is Baleh assemblyman, reiterated that the whole idea of setting up the ‘merger of minds’ is to strengthen the BN coalition against threat from the opposition. KUCHING: The government is looking into the possibility of promoting the state as a destination for youth sports, in line with the focus to promote a healthy lifestyle among the younger set. According to Social Development Minister Tan Sri William Mawan, the youths should be actively involved in sports and dare to compete with their counterparts from other states. “International events can be held here in the state with our youths capable of competing internationally and therefore I urge our youths to buckle up and get involved in sports,” said Mawan. His speech was read by his representative Aishah Edris at the Sarawak Regional Yoyo Contest held in conjunction with ‘You Are The 1- Youth Carnival’ at Plaza Merdeka on Sunday. According to Mawan, his ministry is committed to assisting youths by offering the right platform for them to be active in such sports. “We are proud to provide support and commitment and this year alone, more of such programmes are in the pipeline, such as the I.M.A.G.I.N.E Retrowalk this coming October which is expected to attract thousands of youths,” he said. The minister also lauded the effort by Yoblitz Team Sarawak and the 1BFF Sports and Recreational Club Pending for bringing the yo-yo event to Sarawak. Meanwhile, event chairman Ryan Chung said the event which was held for the fifth time, was first held in 2010. “It is our wish for yo-yo to get the attention from the state government and for consideration to be included as one of the sports in Sukma 2016 to be held in Sarawak,” he said. The event, which saw judges comprising world yo-yo champion Marcus Koh and Malaysian champion Mohd Shakeel, saw participants from Singapore, Indonesia and other states such as Sabah and Penang. Sarawakian Adi Hisham Mohtar was crowned the winner and will represent the state at the Asia Pacific Yoyo Championship in Singapore.